Over the last week, Belarusian state television reported widely on a public discussion on a nuclear power plant in Astraviec. Nearly 200 journalists and activists came from Lithuania to take part in the event. Media covered also a draft bill that will free up business. Among international events, protests in Egypt were widely covered. Astraviec nuclear power plant: politics and economy behind Lithuanian protests, not environmental concerns. Belarusian TV commented on the public discussion in Astraviec with two hundred Lithuanian journalists and activists who came to the event. They emphasised that the Belarusian side has done a lot to satisfy Vilnius with regard to the planned construction. The media added that even the official documents regarding the nuclear power plant’s ecological compatibility are freely available on the Internet and in the Lithuanian language “for the convenience of our neighbours”. A number of Lithuanian nationals were hoping to work on the Ignalina nuclear power plant, but since it will not be built, they sent their job applications to the Astraviec plant and are ready to work. Television noted the absence of Lithuanian representatives and diplomats, who spoke about the alleged secrecy of the Belarusian project. The reality of the situation is rather different according to Belarusian television. It emphasised free visas for Lithuanians, and the translation of official documents into Lithuanian, demonstratinb the openness and transparency of the project. The state media also drew attention to the well-represented segments of the Lithuanian press and activists attending the event. It asked them why Vilnius so vigorously opposed the construction of the first Belarusian power plant. Oleg Davidiuk, from the Lithuania-based centre Kron put it bluntly: “We are jealous of Astraviec.” A journalist from Lithuania, Alexander Ivanov from Litovski Kurier newspaper, argued that “Lithuania is losing the nuclear race”. The state media also focused on this as the real reason why Vilnius is still opposing the Belarusian project. TV also featured Alexander Lukashenka, who in March lectured about the importance of the project: “our power plant together with the Russian one in Kaliningrad gives more to the EU and the Baltic States. They did not manage to construct their own power plants. (…) They will have to buy both our and Russian energy”. The report concluded that “Astraviec is not an island, but a significant archipelago in a sea of huge, ecologically-minded, safe and still-growing European power engineering”. Advanced Armed Forces to protect independence of Belarus. Recently Lukashenka chaired a meeting on the development of the Belarusian armed forces. In his words, “In this new reality, our armed forces should be ready to defend our sovereignty and territorial integrity”. He also argued that some countries, particularly the Western ones and the NATO bloc, including the US, continue to apply pressure to some “unwelcomed countries”, later explaining that Belarus remained such a state. Lukashenka ordered the Ministry of Defence to carry out and fully realize the agreement with Russia regarding its air force and anti-aircraft warfare. Liberalisation of business. Lukashenka held a meeting on how a series of legal amendments stimulate business in Belarus. Belarusian state TV emphasised that the authors of a draft bill considered changes that would facilitate business and remove barriers to its further development. The journalists covered a number of tools which could liberalise the business environment; among them, the optimisation of the terms of punishment, to include fines and deposits instead of imprisonment. Lukashenka emphasized that the “interests of our citizens should be the basis of any reforms”. Uralkali guilty of Belaruskali troubles. TV drew attention to the difficult situation surrounding a Belarusian company producing potash. It commented that a “Russian company ceased to sell its products via the Belarusian company”, which had hindered its position. Valery Kirpienko, the executive of Belaruskali, explained that “it will not only be we who will suffer from negative consequences, but Uralkali too, and most important of all – our customers”. State television reported that the Belarusian company would take a few steps to become more independent and would have its own port terminals. So far it holds a 30 percent shares in the Lithuanian port terminal in Klaipeda, and is now planning to have one in Brazil also. The company’s management is also considering seeking a market in Africa. Egypt submerged in bloody protests. 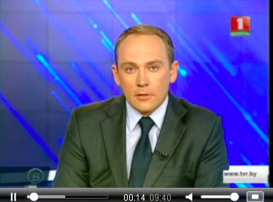 Belarusian television reported on the recent bloodshed in Egypt. It showed scenes of violent struggle sweeping the country, and also reached popular resorts. The Belarusian media commented on this, citing “hundreds of victims. The number of deaths over these days is simply incomprehensible”. They also added that the international community had already criticised the events and called upon Egypt to start peace talks. Belarus praised for its initiative in combating human trafficking. Minsk hosted a five-day seminar on combating human trafficking and slavery. State TV reported that the representative of the United Nations to Minsk praised Belarus and confirmed its further support for Minsk in its activity in the area. The state channel highlighted that the Belarusian authorities initiated the establishment of a group of countries, now composed of 22 states, which will deal with the problems of human trafficking and other related issues. Minsk proposed combatting the issue on a global scale. The Belarusian media mentioned, however, that worker exploitation of Belarusian nationals in Russia remains a serious problem. Further, they repeated the words of Lukashenka who in May said, “12-13 years ago we started to deal with the problem of human trafficking very actively in all its forms. We have experience in it. We are proud of this fact”. The youngest pensioners in the world. Television reported that Belarus, together with Russia and Ukraine, remains the country with the lowest age for retirement. Belarusian men can retire at the age of 60, and women at 55. “In our Western neighbouring countries people need to work for much longer,” it said, and mentioned countries such as Poland, Latvia, but also Germany. The reports stressed that among the EU countries, only France still “maintains these social guarantees”. No medals, no money. Lukashenka announced that only athletes with high achievements would receive significant funds from the state. State TV stated that, “the state loses a huge amount of money in this sphere and has a right to demand an appropriate output”. He referred to the unsuccessful performance of Belarusian athletes during the recent World Atheletics Championship in Moscow. In Lukashenka’s words, “an athlete will receive a basic salary for high achievements, not for getting 21st or 41st place”. He concluded that “sport, like entrepreneurship, should earn money”. Belarus Digest prepared this overview on the basis of materials available on the web site of Belarusian State Television 1 (BT1). Freedom of the press in Belarus remains restricted and state media convey primarily the point of view of the Belarusian authorities. This review attempts to give the English-speaking audience a better understanding of how Belarusian state media shape public opinion in the country. On 12 August 2013 Ruslan Mirzoeu, an ordinary worker from Minsk was arrested for making a short provocative movie, ridiculing the life of socially deprived people. A couple of other cases of pressuring individuals for producing videos with social criticism have followed since then. The Belarusian government resisted attempts to undermine its “social stability” myth, but these incidents will likely not lead to a new wave of harsher authoritarianism. The current regime will not punish people for simply any kind of citizen journalism and internet-activism. 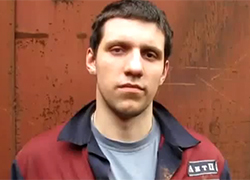 Ruslan Mirzoeu, an ex-drug addict, serving his term of restrained freedom (akin to house arrest) for theft, has become famous among Belarusian Internet users after he shot a series of short movies about ordinary working days at his machine-building plant. These movies were full of cursing, workers’ complaints, pictures of horrible working conditions and general gloomy atmosphere. However, funny comments and interviews with workers made these videos rather entertaining. The management of Ruslan’s plant made him leave his job under threat of “severe measures” to be taken against me if he continued with his videos. This did not stop Ruslan. He shot another movie about his own neighbourhood Kurasoushchyna, showing the ugly side of urban life: street fights, people drinking, taking drugs etc. As Ruslan later confessed, he faked some of the stories. This time the police paid attention to his work. With state TV cameras in the courtroom, Ruslan was sentenced to seven days of administrative arrest for hooliganism (disorderly conduct), charges that were presented as if he himself cursed in public places and disturbed the passers-by. The state TV newscasters covering the trial said something unimaginable in such a democratic state: “The prosecutors do not conceal that the true reason of his arrest is not public cursing: “One cannot deserve to have such popularity by manipulating social problems” – said Pavel Radionov, the prosecutor. In other words, the state representative openly admitted to arresting a man for publicly showing a bad image of the Belarusian society. This story could have been explained as the casual excess and abuse of power of some second-rate official, which certainly somtimes happens in Belarus (for instance – prohibition of Press Photo album annual contest for extremism). But it fell in line with several other recent cases of pressure on people who also shot amateur videos that are unpleasant for the state. On 6 August blogger and social activist from Svyatlahorsk, a district centre in the Homel region, Henadz’ Zhulega shot a luxurious cottage which belongs to the Head of a district on video, commenting on how rich this official was, while his town continues to stagnate. On 17 August, after the video was put online, policemen searched the activist’s home, confiscated his computer and warned him of a possible charge for defamation that could be brought against him. A physician from Vitebsk (a regional centre in the north of Belarus), Ihar Pasnou, has recorded a number of public video addresses to the Vitebsk region’s governor. He harshly criticised local hospitals’ management and health care officials, in particular, for misspending funds. In December 2012 Dr Pasnou lost his job but continued recording his video messages. On 16 August 2013 he informed journalists that he was put to a mental hospital after being threatened to be forced to go there. He refused be treated. On 19 August the doctors at the mental hospital took away his cell phone. However different the described cases may seem, they indicate a relatively new trend in Belarusian politics: authorities are beginning to approach internet activism, blogging and social criticism by means of citizen journalism as a legitimate target for suppression. A number of the provisions in the legislation enable such persecution. In addition to the previously mentioned hooliganism and defamation offences, often used by authoritarian governments for repressions, the Belarusian Criminal Code contains specific clauses for such cases. Articles 369 and 369-1 (“An Insult of the Authority” and “Discrediting the Republic of Belarus”) remain two of the most criticised norms of the Criminal Code. Although the second clause requires “reporting false data about political, economic <…> situation in the Republic of Belarus or its citizens’ legal status to the foreign or international organisation”, Belarusian courts and police interpret the law broadly when it concerns politics. For instance, in 2011 the court in the town of Mazyr’ fined local activist Mihail Karatkevich for announcing a mass rally on his social network account, having accused him of “unlawfully organising a massive public event”. In 2012 two women from Minsk had to pay large fines for a photosession with teddy-bears in the street (recalling the teddy-bear airdrop). The court accused them of “unlawful picketing”. These series of these cases provoked a discussion among Belarusian expert community. Blogger and journalist Dmitry Galko called this trend “citizen journalism”. He explained its growing influence by the decline of traditional media: state propaganda can only create rosy pictures of reality, while independent publications, suppressed by the government, lack the time and resources to properly cover the lives of real people. Two media experts, Aleksander Klaskouski and Pauliuk Bykouski, doubted the prospects of citizen journalism and criticised it for its lack of professionalism and ignoring media ethics: “How would you treat “citizen” dentistry or “citizen” surgery”, – they argue. Klaskouski says, in the West so-called “citizen journalism” has a very narrow field of application: emergency situations, military actions, public rallies etc. – situations which traditional media sometimes cannot promptly cover. Whatever it is called, this new trend irritates the Belarusian authorities. Dmitry Galko put it eloquently: “The authorities want to maintain their monopoly on producing the picture of reality”. In all of the three stories described here, ordinary apolitical people tried to show real life in Belarus, with all of its problems and various miseries. The Belarusian government, who bases its legitimacy on “stability and prosperity” myth, cannot let anyone undermine it. The future of Belarusian citizen journalism and other forms of civil activity on the internet depends on how the government will respond to the current series of such cases described in the article. Cracking down on several activists of this kind in a short time period will send a clear signal to bureaucracy all over the country. If the given response is rigid, it will create a precedent. Belarusian officials, when facing such activism again will prefer to act tough with such issues because nobody will punish them for being too firm, but any sign of being soft can be seen as risky. However, in reality, a truly tough response seems unlikely to follow. For now the internet has remained the only area where people can criticise the regime, usually without any consequences. Punishment on a regular basis for simply ridiculing the pictures of peoples’ ordinary lives or any internet-criticism will elevate the Belarusian regime to a new level of authoritarianism. A government in the centre of Europe, which occasionally needs to improve its relations with the West, cannot afford to act this way. On the other hand, potential citizen journalists will now think twice before making videos on socially sensitive issues. Ruslan Mirzoeu’s case and a couple of other similiar stories can become a serious deterrent for them.